Every now and then, someone at the grocery store or post office asks if I’m the lady who writes in the Sunday newspaper. “It depends,” I say. “Are you for her or against her?” We’ll laugh and they’ll tell me they recognized me by my red hair but thought I’d be taller and then we’ll go on about our business. But occasionally, somebody will want to chat about the writing life. Which, if I’m not in a hurry, is fun. The same question always starts the conversation: How do you come up with your ideas? There’s no easy answer. Pulling a column out of thin air 52 times a year is a terrifying prospect if you look at it that way. So I don’t. I just concentrate on producing one good column every week, one week at a time, and trust that ideas will come. Meaning that my mind seldom rests. And that I must always have paper and pen—or the notes app on my cell phone–close at hand. Because it’s for sure that I won’t remember the oh-so-brilliant thought I had if I don’t write it down. I seldom fire up my computer and stare at a blank screen while gnashing my teeth and muttering incoherently under my breath. Before I sit down to write, I know my topic and—in a messy kind of way—what I want to say about it. Because I always have “think time” before I sit down at my desk. While straightening out a drawer the other day, I came across an old-timey pink rubber ball. You know the kind. It’s about the size of a pool ball and made of the same spongy rubber a pencil eraser is made of. It even smells like a pencil eraser. I owned countless balls just like it when I was a kid, but I know for sure this isn’t one of them. How? It’s stamped with a bar code and was made in—you guessed it!—China. The summer before I started third grade, my family moved to New Jersey. My brother was only five years old and not much fun to play with and I didn’t have a single friend in my new town. But I did have a pink rubber ball, which I took to the playground at a nearby deserted grammar school. I threw that ball against a two-story high brick wall and caught it about a million times in those endless weeks before school began. I credit those lonely days with honing my agility and my hand-eye coordination. More than that, those solitary ball games provided think time. Time I used to make up stories in my head. Sometimes, when I got home, I wrote the stories down. I suppose that’s how I got my start as a writer. 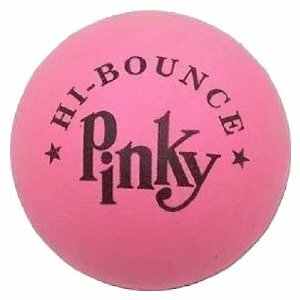 Just for grins, I googled “pink rubber ball” before I began writing this column. The balls are still readily available and cost about a dollar apiece. Oddly enough, most user reviews don’t talk about how much fun the ball is to play with. No. They talk about its therapeutic benefits. Some folks squeeze the ball to relieve tension, others to strengthen muscles in the forearm. Those with aches and pains roll it over whatever parts of their body are hurting. One woman with back problems described in detail how she likes to lie on the floor with the ball directly under her spine, claiming that it releases every single knot with ease. And who would have thought that I, who just an hour ago had no idea what in the world I was going to write about this week, could have come up with a column about an old-timey pink rubber ball?